The AgustaWestland AW101 is a medium-lift helicopter used in both military and civil applications. First flown in 1987, it was developed by a joint venture between Westland Helicopters in the United Kingdom and Agusta in Italy in response to national requirements for a modern naval utility helicopter. Several operators, including the armed forces of Britain, Denmark, Norway and Portugal, use the name Merlin for their AW101 aircraft. It is manufactured at factories in Yeovil, England and Vergiate, Italy; licensed assembly work has also taken place in Japan and the United States. Prior to 2007, the aircraft had been marketed under the designation EH101. The original designation was in fact EHI 01, from the name given to the Anglo-Italian joint venture – European Helicopter Industries – but a transcription error changed this to EH101 and the designation stuck. In 2000, Westland Helicopters and Agusta merged to form AgustaWestland, leading to the type's current designation. The AW101 entered into service in 1999, and has since replaced several older helicopter types, such as the Sikorsky Sea King, performing roles such as medium-sized transport, anti-submarine warfare, and ship-based utility operations. The Royal Canadian Air Force (RCAF) operates a variant of the AW101, designated CH-149 Cormorant, in the air-sea rescue role. Another variant, designated VH-71 Kestrel, was being developed to serve in the US presidential transport fleet before the program was cancelled. Civil operators also use AW101s in roles such as passenger and VIP transportation. The type has been deployed to active combat theatres, such as in support of coalition forces during the Iraq War and the War in Afghanistan. In 1977, the UK Ministry of Defence issued a requirement for an anti-submarine warfare (ASW) helicopter to replace the Royal Navy's Westland Sea Kings, which were becoming inadequate in the face of advances in Soviet submarine technology. Westland Helicopters put together a proposal, designated WG.34, for a three-engined helicopter of similar dimensions to the Sea King; the WG.34 was to feature more autonomy and a greater range than its predecessor. At the same time, the Italian Navy (Marina Militare) was also considering the replacement of its fleet of Sea Kings, which had been built by the Italian company Agusta; Westland and Agusta soon began talks regarding the joint development of a successor helicopter. Agusta and Westland finalised an agreement to work on the project together, and formed a jointly owned new company, EH Industries Limited (EHI), to pursue the development and marketing of the new helicopter to potential operators. On 12 June 1981, the UK government confirmed its participation in the project, allocated an initial budget of £20 million to develop nine pre-series examples. A major agreement, which secured funding for the majority of the EH101's development program, was signed by both the British and Italian governments in 1984. At the 1985 Paris Air Show, Agusta showed a mock-up of a utility version of the new helicopter, leading to a more generalised design that could be customised to meet the needs of various civilian or military customers. The first prototype flew on 9 October 1987. In 1987, Canada selected the EH101 to replace their Sea Kings in the anti-submarine warfare and search and rescue roles. The EH101's third engine and increased range compared favorably with rival aircraft, such as the Sikorsky Seahawk. The range and de-icing capability were also seen as vital for North Atlantic operations. The fledgling EH101, of which up to 50 were on order to replace the Canadian Armed Forces's (CAF) Sea Kings, found itself subject to a wider political battle between the Conservative and Liberal parties, the latter viewing the aircraft as too costly. Critics attacked the EH101 purchase as excessive and unnecessary after the Cold War's end in the early 1990s. Wide-ranging cost estimates were presented by both proponents and opponents of the EH101 procurement, with opponents backing life extensions of Sikorsky CH-124 Sea King and Boeing Vertol CH-113 Labrador helicopter fleets. The EH101 controversy was seen as a factor in the 1993 Canadian federal election. The order was cancelled by the new Liberal government in 1993 resulting in a $470 million cancellation fee. Several pre-production aircraft were assembled during the late 1980s and early 1990s. Flight tests were suspended for six months following the crash of the second pre-production aircraft on 21 January 1993. On 6 June 1993, the first EH101 flew with the Rolls-Royce/Turbomeca RTM322 turboshaft engine. Nine prototypes were built to explore military and civil applications, including a "heliliner" configuration. In February 1995, Britain formally placed its first order for a total of 22 EH101s; this was quickly followed by Italy's order for 16 EH101s in October 1995. The EH101 order was not without controversy, the RAF had declared its preference for an all-Chinook fleet; also, Boeing allegedly offered cheaper terms for the Chinook. RAF deliveries began in 1997; RN deliveries started the following year. In 2005, a team of AgustaWestland and Lockheed Martin was selected as the winners of the US VXX competition to replace the President's Marine One helicopters of the United States Marine Corps. A variant of the AW101, designated VH-71 Kestrel, was to be manufactured domestically and had proceeded into the flight testing stages. However the programme encountered significant cost overruns and political opposition, which led to the procurement being scrapped in June 2009. Separately, the Marine Corps had also conducted studies into the adoption of the EH101 as a fallback option to the Bell-Boeing V-22 Osprey tiltrotor during the 1990s. Following the merger of Westland and Agusta to form AgustaWestland in 2000, there was no need for the separate EHI entity; the EH101 was formally re-branded as the AW101 in 2007. 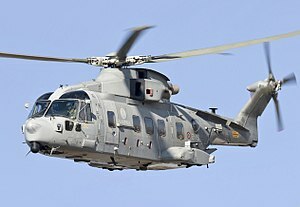 In 2008, the volume of AW101 orders was reported as having filled production capacity in excess of the following five years. By April 2009, more than 180 AW101s had been sold worldwide; the combined operational fleet had also accumulated a total of 170,000 flying hours. In November 2007, Algeria signed a contract for 6 AW101 helicopters. In August 2012, it was reported that Algeria had signed an agreement with AgustaWestland for the provision of up to 80 helicopters, 42 of which were to be AW101s. Under the terms of this arrangement, early aircraft were to be manufactured by AgustaWestland, while Algeria was to commence the assembly of some AW101s later on. On 7 June 2010, it was announced that Boeing had acquired a manufacturing license and the rights from AgustaWestland for US production of a localised AW101 variant, designated as the Boeing 101. In October 2012, the AW101 was submitted in a U.S. Air Force competition to replace the HH-60 Pave Hawk; however, the bid was dropped three months later. In September 2013, AgustaWestland was reportedly in the process of acquiring new civil certification for the AW101, target customers include long-range offshore oil platform transport operators and VIP clients. As of February 2014, AgustaWestland was considering adapting the AW101 as a heavyweight unmanned aerial vehicle, it is proposed that in this configuration an AW101 could be optionally manned. The AW101 Merlin follows a conventional design layout, but makes use of advanced technologies, such as the design of the rotor blades, avionics systems, and the extensive use of composite materials. The fuselage structure is modular and comprises an aluminium-lithium alloy, designed to be both light and damage-resistant. The AW101 is designed for operating in extreme weather conditions; it is fitted with a de-icing system and rated to operate in temperatures ranging between −45 and +50 °C. The aircraft's control systems allow the AW101 to maintain a stable hover in 74 km/h (40 kn) crosswinds. An active vibration control system, known as the active control of structural response system, reduces airframe vibration by up to 80% which increases crew comfort and minimises the buildup of stress on the airframe. The cockpit is fitted with armoured seats for the crew, and can withstand an impact velocity of over 10 m/s. Dual flight controls are provided, though the AW101 can be flown by a single person. The pilots' instrument displays include six full-colour high-definition screens and an optional mission display; a digital map or forward looking infrared (FLIR) display can also be installed. The AW101 is powered by three turboshaft engines. The Rolls-Royce/Turbomeca RTM322 and General Electric CT7 are the two available engine types. The Rolls-Royce RTM322 was specifically developed for the AW101; it was subsequently adopted on the WAH-64 Apache and the NHIndustries NH90 helicopters. About 80% of AW101s use the RTM322 powerplant, according to Rolls-Royce. The engines power an 18.59 metre diameter five-bladed main rotor. The rotor blades are constructed from carbon/glass with nomex honeycomb and rohacell foam, edged with titanium alloy in a sandwich construction. 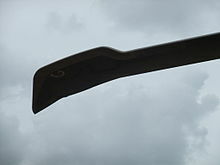 The shaping of the main rotor blades is derived from the BERP rotor blades first used on the Westland Lynx. This blade design improves aerodynamic efficiency at the blade tip and reduces the acoustic signature. Improved BERP IV rotors have since been developed; when installed, this increases the AW101's maximum takeoff weight. Each engine is supplied by a separate 1,074 litre (276 US Gallon, 230 Imperial Gallon) fuel tank using dual booster pumps. Optional fourth and fifth tanks can be added to act as a reservoir supply, topping up the main tanks during flight, increasing range or endurance. The AW101 can also be outfitted with a probe for aerial refuelling. Self-sealing fuel tanks are an optional item to be selected by the customer. An inlet particle separator system can be installed, protecting the engine when operating in sandy environments. Most variants of the AW101 are equipped with self-defence systems, such as chaff and flare dispensers, directed infrared countermeasures (infrared jammers), ESM (electronic support measures in the form of RF heads), and a laser detection and warning system. British Merlins have been outfitted with protective armour against small-arms fire. A side-mounted forward looking infrared (FLIR) imaging sensor has been fitted to some variants. Two hardpoints are present in the underside of the airframe on which the HM1 model can carry four Sting Ray torpedoes or Mk 11 Mod 3 depth charges. Some customers have chosen to deploy the Marte anti-ship missile on the AW101; as of 2011, the Royal Navy is considering equipping their Merlin fleet with an anti-surface missile. The Mk1, Mk3 and Mk3A variants can mount general purpose machine guns in up to five locations in the main cabin, aimed out of both door and window apertures. AgustaWestland has examined the integration of rockets and additional ground-attack weapons. Westland and IBM formed a consortium in 1991 to perform the helicopter's complex systems integration. The AW101 features a network of helicopter management and mission systems designed to reduce pilot workload and enable the helicopter to undertake a wide variety of missions. A digital automatic flight control system (AFCS) is employed by the AW101. The AFCS allows the operation of a four-axis (pitch, roll, yaw and collective) autopilot and the automatic stabilisation system, and is linked in with the aircraft's flight management systems. The AFCS, manufactured by Smiths Aerospace, is a dual-duplex system using two flight computers to provide redundancy and fault-tolerance. The AW101's navigation system includes a GPS receiver and inertial navigation system, VHF omnidirectional radio range (VOR), instrument landing system (ILS), TACAN, and automatic direction finding. The Mk1 and Mk3 are equipped with a Doppler velocity system (DVS) which provides relative ground velocities; the DVS is also linked into the AFCS as part of the autostabilisation system. For safety, the aircraft is equipped with obstacle and terrain avoidance warning systems, traffic collision avoidance system (TCAS), and both voice and flight data recorders. The AW101 is equipped with the Blue Kestrel search and detection radar which is capable of 360 degree scanning and can detect small targets as far as 25 nautical miles. As part of the Royal Navy's Merlin HM2 upgrade program, Lockheed Martin implemented a series of improvements to the radar, notably allowing it to track 40 times the number of targets previously capable. Danish EH101s are fitted with the RDR-1600 search and weather radar. Mk 2 Royal Navy Merlins are equipped with the AQS901 anti-submarine system for processing sonographic data from sonobuoys to detect and target submerged submarines. The AQS901 was derived from the system on the earlier Hawker Siddeley Nimrod maritime patrol aircraft. The AW101 is typically operated by a crew of three: a pilot, an observer, and a crewman/operator. The pilot is able to fly for the majority of a mission in a hands-off mode, enabled by the sophisticated autopilot. All crew members have individual access to management computers and tactical information. The fuselage has a volume of 31.91 cubic metres (1,127 cu ft) and the cargo compartment is 6.5 metres (21 ft) in length, 2.3 metres (7 ft 7 in) wide and 1.91 metres (6 ft 3 in) high. The military version of the AW101 can accommodate up to 24 seated or 45 standing combat troops and their equipment. Alternative loads include a medical team and 16 stretchers, and cargo pallets. The ramp, 1.91 by 2.3 metres (6 ft 3 in × 7 ft 7 in), can take a 3,050-kilogram (6,720 lb) load, allowing it to carry vehicles such as Land Rovers. The ramp and cabin floor are fitted with flush tie-down points. 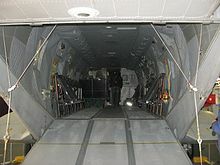 A cargo hook under the fuselage can carry external loads of 5,440 kilograms (11,990 lb) via the use of a semi-automatic cargo release unit (SACRU). A rescue hoist and a hover trim controller are fitted at the cargo door. An optional cargo winch can be installed near to the rear ramp. The RN's final order was for 44 ASW aircraft, originally designated Merlin HAS.1 but soon changed to Merlin HM1. The first fully operational Merlin was delivered on 17 May 1997, entering service on 2 June 2000. All aircraft were delivered by the end of 2002, and are operated by 3 Fleet Air Arm squadrons: 814 NAS, 820 NAS, 824 NAS and 829 NAS (now disbanded and merged with 814 NAS), all based at RNAS Culdrose in Cornwall. 700 NAS was the Merlin Operational Evaluation Unit from 2000 to 2008. In March 2004, Navy Merlins were temporarily grounded following an incident at RNAS Culdrose in which a tail rotor failed due to a manufacturing defect. An improved tail rotor was designed and adopted on most AW101s; according to AgustaWestland, the redesigned rotor also significantly reduced associated maintenance. In 1995, it was announced that the Navy's Westland Lynx helicopters would be retired in favour of an all-Merlin fleet. However, the subsequent Strategic Defence and Security Review 2010 stated that the future naval helicopters would be the Merlin and the Wildcat, a derivative of the Lynx. Royal Navy Merlins have seen action in the Caribbean, on counter-narcotics and hurricane support duties, as well as maritime security duties in the Persian Gulf. Merlins have also seen active duty in Iraq, providing support to British and coalition forces based in the region. The Merlin HM1 has been cleared to operate from the Royal Navy's aircraft carriers, amphibious assault ships, Type 23 frigates and several Royal Fleet Auxiliary (RFA) vessels including the Fort Victoria class; it is also to equip the Type 45 destroyer. 30 aircraft have been upgraded to Merlin HM2 standard under the £750m Merlin Capability Sustainment Programme; Lockheed Martin UK delivered the final HM2 on 11 July 2016. The HM2 has a new mission system, digital cockpit, electro-optical camera and multi-static processing for the sonar system. The HM2 performed its first ship-borne test flight in September 2012 and achieved IOC on 30 June 2014, after nine HM2 had flown 480 hours from Illustrious during Exercise Deep Blue earlier that month. It was also reported that some of the eight airframes not scheduled to be upgraded for financial reasons may be updated. Five HM2s are in maintenance at any one time, leaving 25 available at readiness, of which 14 will be assigned to the Queen Elizabeth-class aircraft carrier. In addition to its anti-submarine role, the HM2 will be able to carry an airborne early warning (AEW) pod under procurement through the Crowsnest programme to replace the Sea King ASaC7. In September 2011, Thales UK proposed re-using Sea King ASaC7 equipment, such as the Searchwater 2000, on the Merlin; Lockheed Martin has proposed developing a new multi-functional sensor for either the AW101 or other aircraft. Lockheed originally planned to use a derivative of the F-35's APG-81 radar but is now believed to be using an Elta system; both it and the Thales system will begin flight trials in the summer of 2014 with Main Gate in 2016. Ten pods are planned with IOC in 2019. On 22 May 2015, The MOD and Lockheed Martin UK, as the prime contractor for Crowsnest, selected Thales as the chosen bidder to provide the radar and mission system at the heart of the Crowsnest capability. On 15 December 2009, plans were announced to transfer RAF Merlin HC3s and HC3As to the Royal Navy's Commando Helicopter Force to replace retiring Sea King HC4 helicopters. The Sea King was set to retire in 2016, leaving the Navy operating a combination of the Wildcat and Merlin. 846 NAS reformed with ex-RAF Merlin HC3s on 30 September 2014; 845 NAS followed on 9 July 2015. On 25 May 2018, the first of 25 new Royal Marines Commando Merlin Mk4/4A were delivered to Royal Naval Air Station (RNAS) Yeovilton. The RAF ordered 22 Merlin HC3 for transport missions, the first of which entered service in January 2001 with No. 28 Squadron RAF based at RAF Benson. The type is equipped with extended-range fuel tanks and is capable of air-to-air refuelling. The Merlin is frequently utilised for troop transport duties and for the transport of bulky objects, either internally or underslung, including vehicles and artillery. The Merlin Depth Maintenance Facility at RNAS Culdrose performed most tasks upon the Merlin HC3. The Merlin's first operational deployment was to the Balkans region in 2003. RAF Merlins were first deployed to Iraq as part of Operation Telic in 2004, supporting coalition forces and were operated as the main medevac asset in southern Iraq; both Flight Lieutenant Kev Harris and Flight Lieutenant Michelle Goodman were awarded the DFC during this period. Merlins routinely operated around Basra until Britain's withdrawal in June 2009. 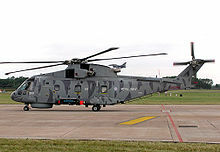 In 2002, Westland made an unsuccessful unsolicited offer to the British Ministry of Defence, proposing an enhanced Merlin variant intended to satisfy the demand for additional lift capacity. An alternative measure was the acquisition of six AW101s from Denmark in 2007; designated Merlin HC3A, these were assigned to the RAF, allowing Merlins to be deployed in Afghanistan. The HC3A is used for training and not for frontline operations due to various configuration differences. In December 2007, a second Merlin squadron, No. 78 Squadron was formed at RAF Benson. In 2009, five Merlin Mk3s were operating in Afghanistan, transporting troops and supplies. The deployment to Afghanistan was criticised as the aircraft reportedly lacked protective Kevlar armour. By July 2010, the Merlin fleet was fully fitted with ballistic armour. The deployment of Merlins to Afghanistan allowed the detachment of Sea Kings to be withdrawn from the region in October 2011. As part of the UK drawdown in Afghanistan, Merlins were withdrawn from theatre in June 2013. In 2012, the RAF's Merlin HC3/3A fleet began to be transferred to the Royal Navy for use by the Commando Helicopter Force. Royal Navy personnel worked alongside RAF crew at Benson to build experience during the transition. A £454m Merlin Life Sustainment Programme will see 25 HC3/3A airframes fitted with the cockpit electronics of the HM2, folding tails and main rotor heads, strengthened landing gear, deck lashing mounting points, obsolescence updates, fast-roping points and a common emergency egress system. The first HC4 is to begin flight trials in September 2017, with an IOC in mid-2018; an interim folding main rotor head will be fitted to some HC3 for shipborne operations prior to the HC4 upgrade. Command of the UK Merlin HC3/3A fleet was formally transferred from the RAF to the Royal Navy during a ceremony at RAF Benson on 30 September 2014. As part of the same ceremony, the RAF's 78 Sqn was disbanded and the Royal Navy's 846 Naval Air Squadron stood-up with the Merlin. The RAF's 28(AC) continued to operate as part of the Commando Helicopter Force until July 2015, when 28(AC) Sqn stood down and 845 Naval Air Squadron stood-up. 846 NAS relocated from RAF Benson to RNAS Yeovilton in March 2015, with 845 NAS following in June 2016. In 1997, the Italian government ordered twenty[clarification needed] EH101 helicopters for the Italian Navy, with options for four more. These EH101s included ten of the anti-surface/submarine (ASuW/ASW) version, four airborne early warning (AEW), four utility, and four amphibious support helicopters (ASH). As of June 2011, the AW101 has also been chosen to meet an Italian Air Force (Aeronautica Militare Italiana) requirement for up to 12 helicopters in the combat search and rescue role to replace several ageing Sea King HH-3F; deliveries are expected from 2014 onwards. The first Italian Navy production helicopter (MM81480) flew on 4 October 1999 and was officially presented to the press on 6 December 1999. Italy accepted delivery of the 21st AW101, configured for anti-submarine warfare, on 4 August 2009. Italian EH101s have operated from a variety of ships and have seen service overseas; in 2009 the Italian Navy used its AW101 fleet as executive transports for visiting heads of state and officials during the 35th G8 summit. In 2010, the Italian Navy deployed three AW101s to Afghanistan, where they were flown in both the transport and utility roles. In 2011, it was reported that the Italian contingent in Afghanistan, consisting of AW101s, had been providing coverage of a wide area of the country. In 1997, in light of the declining condition of its helicopter fleet, Canada launched the Canadian Search and Rescue Helicopter competition. It was won by the EH101, which was designated CH-149 Cormorant in Canadian service. In 2004, the EH101 was entered into a Canadian competition to replace the shipboard Sea King fleet, but the Sikorsky CH-148 Cyclone was selected. In 2013, following difficulties with the CH-148 procurement, the Royal Canadian Air Force (RCAF) was reported to be seriously considering cancelling the contract with Sikorsky and was investigating the possibility of procuring the AW101 instead. In 2001, the Royal Danish Air Force (RDAF) announced the purchase of eight EH101s for SAR duties and six tactical troop transports for 722 Squadron. The last of the 14 AW101s was delivered in March 2007 and the first SAR AW101s became operational out of Karup Airport in April 2007. In 2007, the six troop transport AW101s were transferred to the British MOD; in exchange, the British government ordered six new-build AW101s as replacements for the RDAF. Danish AW101s have a higher gross weight capacity of 15,600 kg and were, as delivered, coated in a paint designed to reduce the aircraft's infrared signature. In the SAR role, RDAF AW101s have a crew of six and were initially painted yellow to distinguish themselves from AW101 allocated to military duties, but were later painted green, and all 14 AW101s are used for SAR and troop transport. On 28 January 2008, the drive shaft of a Danish AW101 broke, leading to an emergency landing at Billund Airport. Following the incident, the Danish fleet was grounded as a precaution and the AW101's future was publicly debated. In the first six months of 2008, the RDAF reported an operational availability of roughly 50%, well below the target of 80%, partly due to an inadequate maintenance organisation and staff shortages. In January 2011, the Danish Ministry of Defence reportedly could not afford the retrofitting of the AW101 fleet for Afghanistan operations, against earlier reports of a deployment in 2012. In February 2013, Aviation Week reported that earlier reliability problems had been resolved and that a full upgrade package would be applied to Danish AW101s; these included the addition of electronic warfare pods and a new electro-optical system, in advance of a deployment in Afghanistan in 2014. In September 2013, Danish AW101s were to receive L-3 Wescam MX-15 electro-optical/infrared (EO/IR) sensors; SAR aircraft already carry the FLIR Systems Star Safire II EO/IR sensor. On 25 October 2007, a project started that had the intent to replace all Westland Sea King search and rescue helicopters with new rescue helicopters by 2020. On 19 December 2013, a contract was signed between AgustaWestland and the government, for the purchase of 16 AW101 helicopters. The agreement came about after fierce competition between different manufacturers to satisfy the Norwegian requirements. Participants were AgustaWestland, Eurocopter, NHIndustries, Sikorsky Aircraft Corporation and Boeing. The government considered that AgustaWestland AW101 met the requirements and specifications in the best possible way. On 12 June 2017, Per-Willy Amundsen, Minister of Justice and Public Security, announced the opening of Leonard's AW101 Norway Training Centre at Stavanger Sola Airport. The training centre includes an AW101 Full Flight Simulator (FFS), jointly developed by Leonardo and CAE to Level D, which is a CAE Series 3000 device, along with an AW101 SAR console training system linked to the FFS to provide rear crew training. The first training course at the centre started prior to delivery of the first rotorcraft. The training center will be used by both Norwegian and foreign AW101 customers. The first AW101 was delivered in November 2017. The Portuguese Air Force had purchased 12 Merlins under a €446 million contract, the first of which was delivered on 22 December 2004. 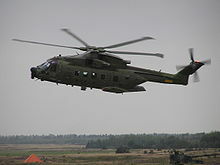 The type has been used to conduct transport, search and rescue, and maritime surveillance missions, progressively replacing the Aérospatiale Puma previously tasked with these missions. The main role of Portuguese AW101s is to perform search and rescue missions within Portugal's maritime zone. They are operated by 751 Squadron and are kept on constant alert at three bases: Montijo near Lisbon, Lajes Field on the Azores, and Porto Santo Island. The Japan Maritime Self-Defense Force (JMSDF) ordered 14 aircraft in 2003 to use in both the airborne mine countermeasures (AMCM) and transport roles. The AW101 was modified by Kawasaki Heavy Industries, and the Japan Defense Agency designated the model MCH-101. Special features include the automated folding of the rotor and tail. For the mine-hunting role, the MCH-101 has been outfitted with Northrop Grumman's AQS-24A airborne mine-hunting system and AN/AES-1 Airborne Laser Mine Detection System (ALMDS) for a complete surface-to-bottom mine detection capability, as well as Mk-104 acoustic mine sweeping gear. In 2002, AgustaWestland, Kawasaki and Marubeni entered a general agreement for cooperation; Kawasaki began the assembly of both the CH-101 and the MCH-101 in 2003. Kawasaki also began licensed production of the RTM322 engines in 2005. In a separate agreement between Marubeni and AgustaWestland, a supply depot was established in Japan to support the MCH-101 and CH-101 fleets. The first MCH-101 was delivered to the JMSDF on 3 March 2006. The MCH-101 will replace the MH-53E (S-80-M-1) in the AMCM role. The CH-101 will operate in the transport/support role for Antarctic expeditions, replacing the Sikorsky S-61A, and will be working in coordination with the Ministry of Education, Culture, Sports, Science and Technology. After a whistle-blower alleged that the MSDF's preference had been improperly changed an investigation was launched. On December 16, 2016 the Japanese Ministry of Defense (the Defense Agency having been upgraded to a ministry in 2007) stated that it had not confirmed lobbying efforts but the ministry admonished Tomohisa Takei, the JMSDF chief of staff, for mentioning the MCH-101 by name during the procurement process to his subordinates. This had come after MSDF officials had reported that the Mitsubishi-built SH helicopters may be best. AgustaWestland developed a specialised luxury variant, the AW101 VVIP (Very Very Important Person, i.e. a head of state), aimed at business and VIP customers. As of April 2009, 15% of all AW101s sold were for VIP purposes. By September 2013, customers operating the VIP variant included Saudi Arabia, Algeria, Nigeria and Turkmenistan. The AW101 was being acquired by the United States Marine Corps under the VXX program as a replacement for the Presidential Marine One helicopters. Designated VH-71 Kestrel, the variant was heavily customised and equipped with various self-defense systems. However, in 2009 the VH-71 procurement was abruptly terminated following the withdrawal of funding. In 2010, Boeing considered an AW101 submission in the restarted VXX program. In April 2009, India ordered 12 AW101 to serve as executive transport helicopters for the Indian President and Prime Minister. The selection followed field trial assessments between the AW101 and the Sikorsky S-92 held in 2008. However, the procurement was put on hold and subsequently cancelled due to the 2013 Indian helicopter bribery scandal, in which Finmeccanica, AgustaWestland's parent company, were accused of using bribery to win the contract. The three helicopters delivered as part of the contract may be returned to the manufacturer as part of the arbitration process. PP1 – Westland-built basic air vehicle prototype, first flown 9 October 1987. PP2 – Agusta-built Italian basic air vehicle prototype first flown on 26 November 1987 and used for deck trials but was destroyed on 21 January 1993 following a rotor brake malfunction. PP3 – Westland-built and the first civil configured Heliliner, used for engine vibration tests and icing trials in Canada. PP4 – Westland-built British naval prototype, lost in an accident on 7 April 1995 after a drive train control rod failure. PP5 – Westland-built Merlin development aircraft eventually equipped with Merlin avionics. PP6 – Agusta-built development aircraft for Italian Navy variant first flown 26 April 1989. PP7 – Agusta-built military utility aircraft with rear-loading ramp. PP8 – Westland-built civil prototype. PP9 – Agusta-built military utility prototype with rear-loading ramp. Italian Navy ASW/ASuW variant, eight built. Powered by T-700-GE-T6A1 engines. Fitted with Eliradar APS-784 radar and Honeywell HELRAS dipping sonar. Armed with torpedoes or Marte anti-ship missiles. Royal Navy ASW/ASuW variant, designated Merlin HM1 by customer. Powered by RTM322 engines and fitted with Blue Kestrel radar, Thomson Marconi FLASH dipping sonar and Orange Reaper ESM. 44 built. Italian Navy early warning variant with same airframe as Model 110 but with Eliradar HEW-784 radar in large underfuselage radome. Four built. Proposed military utility version with no rear-loading ramp. Proposed civil transport with no ramp. In 2000, British International Helicopters conducted service trials using PP8; these did not lead to a commercial service. Proposed version of Heliliner with full airline avionics for operation from oil platforms. No production. Italian Navy transport variant with folding rotors and tail boom. Four built. Royal Air Force transport variant, designated Merlin HC3 by customer, 22 built. Italian Navy special forces and amphibious assault transport with more advanced avionics. Proposed civil utility variant with rear-ramp. Civil utility variant with rear ramp, two built. One used for Tokyo Metropolitan Police Agency and one used to support US101 bid. Canadian military search and rescue variant, designated CH-149 Cormorant by customer. Merlin Joint Supporter for Royal Danish Air Force. Eight acquired for search and rescue (512 SAR) and six for tactical troop transport (512 TTT). The six transports were sold to RAF (as Merlin HC3As) and replaced by six new-build Merlins. Portuguese Air Force search and rescue variant, six built. Portuguese Air Force fisheries protection variant, two built. Portuguese Air Force combat search and rescue variant, four built. Japanese Maritime Self-Defense Force mine countermeasures and transport variant, two built. Presidential Transport variant for the United States Marine Corps as the VH-71 Kestrel, four test vehicles and five pilot production aircraft built. Algerian Naval variant. 6 delivered. Italian Air Force Combat Search and Rescue variant. 15 on order. Norwegian search and rescue variant, operated by the Air Force. 16 ordered with option for 6 more. Saudi Arabian VVIP variant, operated by the Air Force. 2 delivered. Indian VVIP variant. (See 2013 Indian helicopter bribery scandal). Latterly delivered to Nigerian and Azerbaijani Air Forces. Algerian VVIP variant, 2 delivered. Turkmenistani VVIP variant, operated by the Air Force. 2 delivered. .
Royal Navy designation for the Model 111. Avionics retrofit of 30 HM1s for the Royal Navy. RAF Merlin carrying a L118 105 mm howitzer. Royal Air Force designation for the Model 411. Royal Air Force designation for six former Royal Danish Air Force Model 512s modified to UK standards. Royal Navy will fit seven HC3 with folding rotor heads as an interim (3i) measure until the full HC4 upgrade is available. The conversion of 25 RAF HC3/3A for RN use in hand with the first flight taking place in November 2016. HM2 cockpit, folding tail/blades and other adaptations for naval use. Ship-based anti-submarine helicopter for Canada. 35 originally ordered by the Canadian Forces, reduced to 28 and cancelled in 1993. Search and rescue helicopter for Canada. 15 ordered by the Canadian forces, but later cancelled. Search and rescue helicopter for Canada, 15 ordered and delivered. Cancelled USMC variant that was intended to serve as the US Presidential helicopter. Italian military designation from 2012 for the MP variant. Italian military designation from 2012 for the AEW variant. Italian military designation from 2012 for the ASH variant. Italian military designation for the CSAR variant. ^ "Finmeccanica Approves Merger And Spin-Off Operations For The Implementation of The Divisionalisation Process". Retrieved 16 June 2016. ^ a b AgustaWestland 2008, p. 1. ^ "EH-101 Merlin factsheet". Portuguese Air Force. Archived from the original on 20 June 2009. Retrieved 5 February 2010. ^ "Danish Airforce factsheet". Danish Airforce. Archived from the original on 18 June 2008. Retrieved 5 February 2010. ^ "Royal Navy keeps its wings". Flight International. 25 November 1978. pp. 1926–1927. ^ Briganti, Giovanni de. "Agusta, Westland and Europe". defense-aerospace.com. Retrieved 5 February 2010. ^ Aeronautica & Difesa, No. 14, Dec 1987, p. 34. ^ "Go-ahead for Anglo-Italian EH101 Helicopter". Aircraft Engineering and Aerospace Technology. 56 (3): 11–12. 1984. doi:10.1108/eb035956. Archived from the original on 30 July 2012. ^ Twigge, Stephen (August 1992). "The EH101 helicopter: A fully integrated international collaborative program". Defense & Security Analysis. 8 (2): 133–146. doi:10.1080/07430179208405535. ^ Martin 1996, p. 137. ^ McLaughlin, Audrey (28 July 1992). "Cold War 'copters a waste of money". Toronto Star. ^ Martin 1996, pp. 108–109. ^ Dobbin 1993, pp. 108–109. ^ Martin 1996, pp. 124–125. ^ Martin 1996, p. 131. ^ "Canada settles claim on Canceled Helicopters". The New York Times. 24 January 1996. ^ "Sea Kings' possible replacement familiar to Canadians". cbc.ca. 6 September 2013. Retrieved 23 July 2015. ^ a b "AgustaWestland AW101". Jane's All the World's Aircraft. 13 June 2011. ^ Lake 2007, pp. 122–125. ^ a b "Individual History: EH Industries EH101 PP8/G-OIOI/ZJ116" (PDF). RAF Museum. Archived from the original (PDF) on 2 May 2012. Retrieved 17 January 2012. ^ Hotten, Russell (23 February 1995). "Westland tipped for MoD order". The Independent. London. ^ "Italian navy orders 16 EH-101 helicopters". Defense Daily. 10 October 1995. ^ Cooper 1997, pp. 69, 72. ^ Ford, Terry (1997). "Advances in rotorcraft". Aircraft Engineering and Aerospace Technology. 69 (5): 447–452. doi:10.1108/00022669710367434. ^ Evans 2004, p. 24. ^ "Lockheed Martin to Build New Presidential Helicopter" Archived 30 May 2011 at the Wayback Machine. U.S. Department of Defense, 28 January 2005. ^ "US Navy Terminates VH-71 Presidential Helicopter Contract". Flight International, 2 June 2009. ^ "Westland merger confirmed". BBC News. 26 July 2000. ^ Hope, Christopher (27 May 2004). "Italians take controls at UK helicopter maker". The Daily Telegraph. London. ^ David, Adrian (11 April 2008). "Successful ops push up demand for AW101 copters". New Straits Times. Archived from the original on 2 June 2013. ^ "AgustaWestland, 400 million Euro contract in Algeria". Avionews. 20 November 2007. ^ "Algeria orders six Super Lynx helicopters". defenceweb.co.za. 8 August 2012. ^ "Boeing Secures All Rights to AgustaWestland AW101 for US Navy VXX Presidential Helicopter Program." Boeing, 7 June 2010. ^ Sikorsky last bidder standing in USAF's combat rescue helicopter battle. Flight International, 12 December 2012. ^ a b Perry, Dominic. "AgustaWestland pursues new AW101 sales avenues". Flight International, 17 September 2013. Accessed: 17 September 2013. ^ Drwiega, Andrew. "Thinking Outside The Box In Italy ." Rotor&Wing, 28 February 2014. ^ Gunston and Spick 1986, p. 112. ^ Marks, N.G. (August 1989). 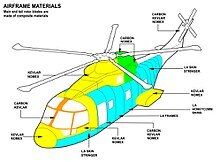 "Polymer Composites for Helicopter Structures". 5 (8). Met. Mater. : 456–459. ^ a b c Crawford 2003, p. 27. ^ Jackson 2009, p. 274. ^ Prince, J. Colin; James F. Farrell; H. Woo; P. Yu; Ray Leerentveld (5 June 1995). "Color AMLCD displays for the EH-101 helicopter". 2462. SPIE: 234–240. ^ Witt, Mike (Spring 1990). "Rolls-Royce—a fount of military power". 135 (1). RUSI Journal: 39–45. ^ "RTM322". Rolls-Royce plc. Archived from the original on 4 March 2009. Retrieved 16 March 2009. ^ Prouty, Ray. Helicopter Aerodynamics, Helobooks, 2003. ^ a b Jackson 2003, p. 236. ^ a b AgustaWestland 2008, p. 4. ^ AgustaWestland 2008, p. 12. ^ a b "Permali Gloucester protects RAF Merlins". Flight International. 22 July 2010. ^ "FLIR Systems awarded contract to provide Thermal Imaging Systems for Royal Danish and Portuguese Air Forces; Contract valued at more than $10 million". Business Wire. 2 October 2002. ^ "Airbus Military C295 carries Marte Mk2/S anti-ship missile for first time". Airbus Military. 17 July 2012. ^ "The Market for Anti-Ship Missiles" (PDF). Forecast International. August 2011. p. 4. ^ Matthews 1992, p. 82. ^ Moir and Seabridge 2008, pp. 343–345. ^ a b c "Agusta Westland's EH101". Avionics Today. 1 February 2005. ^ "Doppler Velocity Sensor ANV-353" (PDF). Selex Communications. Archived from the original (PDF) on 2 May 2012. Retrieved 30 January 2012. ^ "AW101: Avionics". AgustaWestland. Archived from the original on 19 January 2012. Retrieved 6 January 2012. ^ Friedman 1997, p. 202. ^ "$2 Bn for British EH101 Merlin Multi-Role Upgrades". Defense Industry Daily. 19 April 2011. ^ Lavington 2011, p. 428. ^ Evans 2004, p. 23. ^ AgustaWestland 2008, pp. 2–3. ^ Smith, Alan F (1 October 1997). "Aluminum-lithium alloys in helicopters". Advanced Materials & Processes. Archived from the original on 2 June 2013. ^ "Heavy Lift Cargo Hook". onboardsystems.com. Retrieved 28 January 2012. ^ Scott, Richard (9 December 2003). "Sea change". Flight International. ^ a b "Merlin MK1". Royal Navy. Archived from the original on 31 December 2011. Retrieved 5 January 2012. ^ "Probe continues into Merlin crash". BBC News. 31 March 2004. ^ "New Helicopter Blades are a Pilot's Dream." Ottawa Citizen, 21 July 2012. ^ "Merlin HM1 Helicopter On The 'Front Line' For 10 Years". HM Forces. 3 October 2011. ^ a b c d Osborne, Tony (15 July 2014). "U.K. Considering Bringing Orphaned Merlins Into Service". Retrieved 16 July 2014. ^ Scott, Richard (19 July 2016). "Lockheed Martin completes Merlin HM2 deliveries". IHS Jane's 360. ^ Osborne, Tony (28 September 2012). "Merlin Mk2 puts to sea for the first time". Shephard Media. Archived from the original on 16 October 2012. ^ a b Jane's Defence Weekly, 8 July 2009. p. 14. ^ "UK's Crowsnest surveillance programme takes off". Flight International. 17 January 2017. ^ Hoyle, Craig (15 September 2011). "Thales outlines Sea King 7 replacement proposal". Flight International. ^ a b Scott, Richard (7 May 2014). "UK extends Sea King ASaC.7 life out to 2018". IHS Jane's Defence Weekly. Retrieved 16 July 2014. ^ "New surveillance system for future Royal Navy aircraft carriers revealed". www.gov.uk. Retrieved 23 July 2015. ^ a b "Ships and aircraft axed to pay for war against Taleban". Navy News. 16 December 2009. Archived from the original on 11 June 2011. ^ "Navy takes delivery of Merlin fleet". Navy News. 1 October 2014. ^ "845 thrive as famous naval squadron takes charge of battlefield Merlins". Royal News. 10 July 2015. ^ "Royal Navy receives first Commando Merlin - Jane's 360". www.janes.com. Retrieved 28 May 2018. ^ "Defence minister welcomes first of new carrier-ready helicopter fleet - Royal Navy". www.royalnavy.mod.uk. Retrieved 28 May 2018. ^ "The New Royal Marines Commando Merlin Mk4 Helicopter Is Unveiled At RNAS Yeovilton". blogbeforeflight.net. Retrieved 28 May 2018. ^ "Leonardo delivers first Merlin Mk4 - Air & Cosmos - International". aircosmosinternational.com. Retrieved 28 May 2018. ^ a b "Merlin HC3". Royal Air Force. Archived from the original on 23 February 2007. Retrieved 16 January 2012. ^ "Integrated Merlin Operational Support". Serco. Archived from the original on 8 April 2010. Retrieved 5 February 2010. ^ "Merlin HC3". Royal Air Force. Retrieved 5 January 2012. ^ "Top Operational Honour for Pilot". mod.uk. Retrieved 23 July 2015. ^ "Merlin Helicopter Operations in Iraq by Wing Commander Jeff Lindsay". Royal Institute of Navigation. 1 December 2011. Archived from the original on 6 April 2012. Retrieved 5 January 2012. ^ Barrie, D (23 December 2002). "Westland pushes additional Merlins for U.K. lift needs". Aviation Week & Space Technology. 157 (26): 29. ^ Burchell, Bill (6 August 2009). "U.K. Puma Upgrade Approved". Aviation Week. ^ a b c d e f Osborne, Anthony (27 January 2014). "U.K. To Spend £454m On Merlin Modernization Program". Aviation Week. ^ "78 Squadron Operational". Royal Air Force. 3 December 2007. ^ "First RAF Merlin helicopter arrives in Afghanistan amid fierce row over equipment". Daily Mail. 17 November 2009. ^ "MoD denies Merlin 'unsafe' claims". BBC News. 4 August 2009. ^ Hoyle, Craig (25 October 2011). "UK withdraws Sea King transports from Afghanistan". Flight International. ^ Inglis, Will. "Final Flight for Merlins". British Forces News. Archived from the original on 17 July 2013. ^ "Navy News - Reporting from the Fleet". navynews.co.uk. Retrieved 23 July 2015. ^ "Prince Michael of Kent attends service at RAF Benson". BBC News. 10 July 2015. Retrieved 23 July 2015. ^ Ballance, Theo (2016). The Squadrons and Units of the Fleet Air Arm. Air-Britain. p. 211. ISBN 978-0-85130-489-2. ^ "Direzione Generale degli Armamenti Aeronautici: EH – 101". Italian Ministry of Defence. 7 March 2011. ^ Peruzzi, Luca (17 June 2011). "Italian air force chief details Libyan operations". Flight International. Retrieved 4 January 2012. ^ a b "Italian Navy Takes Delivery of Its 21st AW101 Helicopter". AgustaWestland. 4 August 2009. Archived from the original on 5 June 2013. ^ Peruzzi, Luca (15 November 2010). "Italian Navy deploys first AW101s to Afghanistan". Flight International. Retrieved 4 January 2011. ^ "Allies Absent in Afghanistan – Helicopters Hired". Defense Industry Daily. 7 November 2011. ^ a b Plamondon 2009, pp. 151–152. ^ Plamondon 2009, pp. 184–186. ^ "'Other options' sought for Sea King helicopter replacements". CBC.CA. 5 September 2013. Retrieved 6 September 2013. ^ Chase, Steven (5 September 2013). "Helicopter purchase's fate in doubt as Ottawa examines other models". The Globe and Mail. Retrieved 6 September 2013. ^ "AgustaWestland received a UKPd250 mil contract to supply 14 helicopters to Denmark". The Engineer. 21 September 2001. ^ a b c Hoyle, Craig (12 December 2006). "Nordic special: Great Danes". Flight International. ^ a b Osborne, Anthony (4 February 2013). "Denmark Plans AW101 Deployment To Afghanistan". Aviation Week. ^ "EH-101 Merlin Archived 21 December 2013 at the Wayback Machine" Royal Danish Air Force. Accessed: 19 December 2013. ^ "Forsvarets fejlindkøb står i kø". Berlingske Tidende. 4 February 2008. ^ "Danske soldater får helikoptere for sent". Berlingske Tidende. 3 January 2011. ^ "Ingen helikopter til udsendte soldater". Berlingske Tidende. 25 October 2011. ^ Hoyle, Craig (2 September 2013). "Danish AW101s to get MX-15 sensor fit". Flight International. ^ "Leonardo's AW101 Norway training centre opens". Leonardocompany.com. 13 June 2017. ^ Perry, Dominic (20 November 2017). "Norway takes first SAR-roled AW101". Flight Global. Archived from the original on 20 November 2017. Retrieved 20 November 2017. ^ Jennings, Gareth (19 November 2017). "Norway receives first AW101 SAR helicopter". IHS Jane's 360. Archived from the original on 20 November 2017. Retrieved 20 November 2017. ^ Harding Air International July 2010, pp. 70–72. ^ "Portuguese Air Force's AW101 Fleet Achieves 10,000 Flying Hours". AgustaWestland. 12 July 2010. Archived from the original on 30 September 2010. ^ a b c "First MCH-101 Helicopter Goes to Japan Defense Agency". KHI. Retrieved 13 July 2009. ^ Waldron, Greg (25 October 2011). "Japan selects Northrop mine-hunting gear for MCH101 fleet". Flight International. ^ "Milestone RTM322 Engine goes to Japan Defense Agency". KHI. Retrieved 21 December 2009. ^ "Marubeni And AgustaWestland Sign Spares Support Agreement". AgustaWestland. Archived from the original on 25 June 2009. Retrieved 1 April 2010. ^ "Kawasaki Aircraft". KHI. Archived from the original on 23 September 2010. Retrieved 5 February 2010. ^ "EBACE 2008: Agusta Westland targets VVIPs with luxury AW101". Flight Daily News. 19 May 2008. ^ a b c Page, Lewis (9 January 2009). "Could the Airbus A380 be the new Air Force One? – Obama's chopper is European". The Register. ^ Trimble, Stephen (2 June 2009). "US Navy terminates VH-71 presidential helicopter contract". Flight International. ^ "Boeing says AW101 one of its three options for VXX". Flight International. 6 June 2010. Retrieved 10 June 2010. ^ Rao, Radhakrishna (10 August 2009). "India approves deals for Ka-31, AW101 helicopters". Flight International. ^ Pandit, Rajat (30 July 2009). "PM, President to get swanky copters". The Times of India. ^ "PM, President to get swanky copters". The Times of India, 30 July 2009. ^ "India scraps $753m Finmeccanica helicopter deal". BBC News. 1 January 2014. ^ "India to encash 228 m euros bank guarantees of Agusta". Indian Express. 26 May 2014. Retrieved 24 July 2014. ^ a b c Lake 2007, p. 122. ^ "EH101 crash caused by rotor brake". Flight International. No. 19–25 May 1995. p. 5. ^ Lake 2007, pp. 122–123. ^ a b c d e f Lake 2007, p. 123. ^ Lake 2007, p. 124. ^ a b c d e Lake 2007, p. 125. ^ Lake 2007, pp. 125–126. ^ a b Lake 2007, p. 126. ^ Lake 2007, pp. 126–127. ^ a b c Lake 2007, p. 128. ^ Lake 2007, pp. 128–129. ^ Lake 2007, pp. 129–131. ^ a b c Parsons, Gary (13 July 2010). "Portugal's AW101 passes 10,000 hours". Key Aero. Archived from the original on 8 April 2014. ^ a b c d e "Construction List - AW101". Planelogger. Retrieved 13 July 2009. ^ "AW101 611". www.helis.com. Retrieved 18 January 2015. ^ "AgustaWestland to final negotiations". Royal Norwegian Ministry of Justice and the Police. 8 November 2013. Retrieved 8 November 2013. ^ Jennings, Gareth. "Upgraded Merlin HC4/4A for Royal Marines makes maiden flight". IHS Jane's 360. Retrieved 7 November 2016. ^ Reed Business Information Limited. "PICTURES: First Italian air force HH-101A breaks cover". flightglobal.com. Retrieved 23 July 2015. ^ Allport, Dave (July 2013). "First Algerian VIP AW 101 Flight Testing". Air Forces Monthly. ^ a b c d e f g h i j "World Air Forces 2018". Flightglobal Insight. 2018. Retrieved 25 August 2018. ^ "Tokyo Metropolitan Police Department EH -101". Retrieved 17 February 2013. ^ Reed Business Information Limited. "Nigerian AW101 makes debut flight". flightglobal.com. Retrieved 23 July 2015. ^ Guy Martin. "First Nigerian VIP AW101 delivered". defenceweb.co.za. Retrieved 23 July 2015. ^ "French President flies on (made in Italy) VVIP chopper in Saudi Arabia". theaviationist.com. 22 January 2014. Retrieved 25 August 2018. ^ "World Air Forces 2015". Flightglobal Insight. 2015. Retrieved 4 January 2015. ^ "AW101." Archived 6 January 2012 at the Wayback Machine AgustaWestland, Retrieved: 4 July 2014. ^ "EH101 Merlin". deagel.com. Retrieved 9 April 2016. ^ "AgustaWestland AW101/ EH Industries EH101 Merlin - Medium Lift / Multirole Helicopter - Page 2 of 2". militaryfactory.com. Retrieved 23 July 2015. ^ "Merlin Mk1". Royal Navy. Archived from the original on 31 December 2011. Retrieved 4 January 2012. AgustaWestland. AW101 Utility. [permanent dead link] AgustaWestland, June 2008.
Cooper, Neil. The business of death: Britain's arms trade at home and abroad. I.B.Tauris, 1997. ISBN 1-85043-953-2. Crawford, Stephen. Twenty-first century military helicopters: today's fighting gunships. Zenith Imprint, 2003. ISBN 0-7603-1504-3. Dobbin, Murray. The politics of Kim Campbell: from school trustee to Prime Minister. James Lorimer & Company, 1993. ISBN 1-55028-413-4. Eden, Paul, ed. Encyclopedia of Modern Military Aircraft. London: Amber Books, 2004. ISBN 1-904687-84-9. Evans, Nicholas D. Military gadgets: how advanced technology is transforming today's battlefield-- and tomorrow's. FT Press, 2004. ISBN 0-13-144021-7. Frawley, Gerald. The International Directory of Military Aircraft, 2002/2003. Fyshwick, ACT, Australia: Aerospace Publications, 2002. ISBN 1-875671-55-2. Friedman, Norman. The Naval Institute guide to world naval weapons systems, 1997–1998. Annapolis, Maryland, USA: Naval Institute Press, 1997. ISBN 1-55750-268-4. Gunston, Bill and Mike Spick. Modern fighting helicopters. Random House Value Publishing, 1986. ISBN 0-517-61349-2. Harding, Ian. "Long distance wizard". Air International, Vol. 79, No. 1, July 2010. pp. 70–75. ISSN 0306-5634. Lake, Jon. "Variant File: AgustaWestland EH101/AW101". International Air Power Review. Volume 22. Westport, Connecticut, USA: AIRtime Publishing, 2007. pp. 116–135. ISBN 1-88058-879-X. ISSN 1473-9917. Lavington, Simon. Moving Targets: Elliott-Automation and the Dawn of the Computer Age in Britain, 1947–67. Springer 2011, ISBN 1-84882-932-9. Martin, Stephen. The economics of offsets: defence procurement and countertrade. Routledge, 1996. ISBN 3-7186-5782-1. Matthews, Ron. European armaments collaboration: policy, problems and prospects. Routledge, 1992. ISBN 3-7186-5244-7. Moir, Ian and Allan G. Seabridge. Aircraft systems: mechanical, electrical, and avionics subsystems integration. John Wiley and Sons, 2008. ISBN 0-470-05996-6. Plamondon, Aaron. The politics of procurement: military acquisition in Canada and the Sea King helicopter. UBC Press, 2009. ISBN 0-7748-1714-3. Wikimedia Commons has media related to AgustaWestland AW101. This page was last edited on 18 April 2019, at 03:22 (UTC).